Warwickshire pace bowler Boyd Rankin said he still has England ambitions after taking career-best figures of 6-75 against Hampshire at Edgbaston. "Of course, I would love to play for England again. "I thought I had a pretty good winter with the Lions, so I was pretty keen to come back in and continue that form here," the 30-year-old told BBC Sport. Rankin has played one Test, seven one-dayers and two T20 matches for England since switching from Ireland. He bowled with pace and hostility to help the Bears bowl Hampshire out for 319 after they had been 89-0 at lunch on the opening day of their Championship game. With the ball swinging, captain Varun Chopra did not introduce Rankin until the 24th over, but he made the most of his opportunity. "My role is to try and take wickets - thankfully that happened," he said. Londonderry-born Rankin's sole Test match for England came in the final game of the Ashes series in Australia in January 2014, but he recently went on the second-string Lions tour to South Africa. 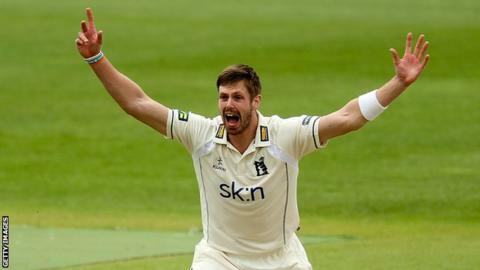 He took 28 wickets in seven County Championship matches last season, but is hoping for a more regular place in Warwickshire's four-day side this summer. And he is hopeful that he can force his way back into the national set up through weight of wickets throughout the season. "I am just concentrating on playing for Warwickshire at the minute, but you never know what might happen down the line," he added.